After 1600 miles from our starting point in Florida, we were ready to tackle the last 350 miles and land in our vacation spot of Rapid City, SD for the rest of the summer. This leg of the journey turned out to be a beautiful ride with rolling hills of prairie grasses, baled hay, and many horses and cows. We had anticipated it to be a long drawn out ride from the East side of South Dakota to the very West side, especially after all the days we had already been on the road. We were absolutely positively right!! During those very long 350 miles of barren road the lil one and I started making up games with the road signs. Of course, they were all variations of ‘I Spy’ in one way or another. I’ll tell ya, you can get to know someone when you go on a road trip with them; but if you want to REALLY get to know them, go on a VERY LONG road trip with them. Don’t get me wrong, I knew my lil one to a tee, but our lil one doesn’t know how our lives were growing up; you should see the eyes light up and the smile we get. We hear “Really?” quiet often as we tell stories of our childhoods. This seemed to go on for hours, there were only so many times you could listen to your favorite cd’s and belt out the parts that we knew without a care in the world. Zooming along America’s Interstates with the wind in your hair, the sun on your face and one of your most favorite people on the Earth riding along by your side; headed to a whole new adventure for the summer; life couldn’t get any sweeter. We were going along at a pretty good speed and all of a sudden we would hit a slow incline that seemed to go up and up forever. 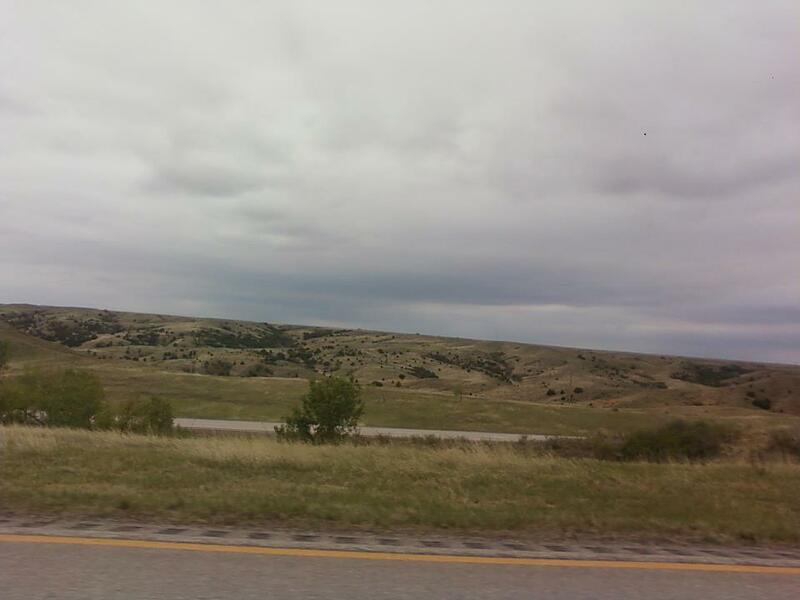 These rolling hills were a pain, ol’Blue didn’t like this one bit; we would go from 65 mph to 40 mph in a heartbeat. Our mantra became “Slow and Steady, Slow and Steady”; after a while “Oh great! Another one!” became the lil one’s favorite reply to the steep hills we were climbing. I personally can’t tell you how many times I prayed that day, hoping one of the 18 or 4 wheelers wouldn’t ram right into my tailpipe when we were forced to slow for the steeper grades, but we survived and ol’Blue was a trooper. 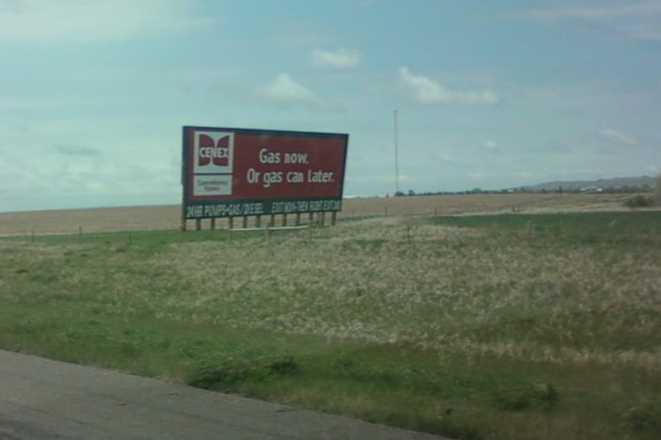 "Gas now, Or gas can later." We learned that gas stations were very few and very far between. 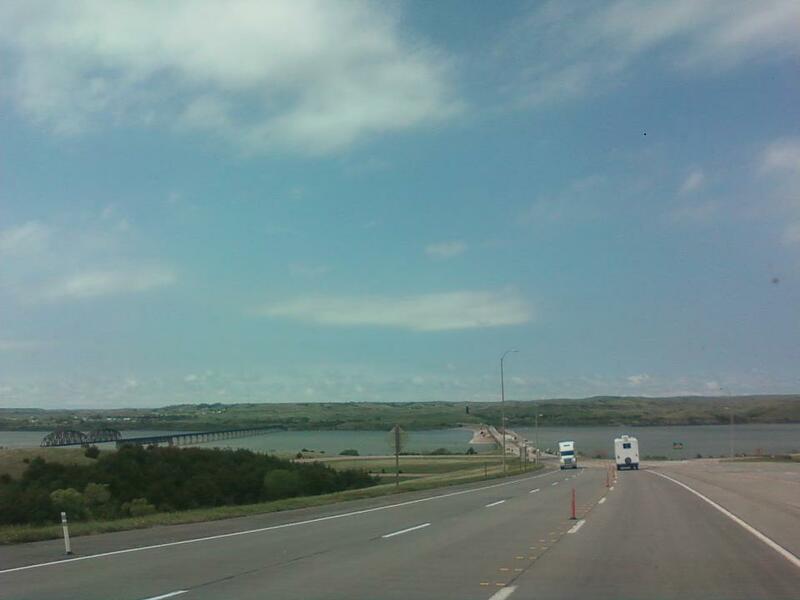 If we were on our second tank and came across a gas station, we were stopping and topping off, no matter what. You just never knew exactly how far and how many long slow diesel burning hills there were between you and the next truck stop. It wasn’t too long before we started seeing signs for Wall Drug. I don’t mean every 100 miles you see a sign, I mean every 3-5 miles you see a sign. I only wish I had taken more pictures of the signs. We could tell when we were getting closer; it was like all the signs for Disney when we turned onto Epcot Center Dr., if you can imagine that. 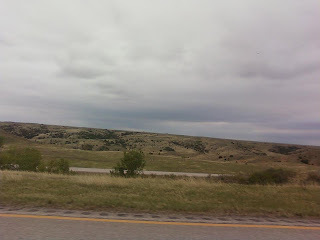 Only about a 100 more miles to go and we would be there, to Wall Drug that is; we still had a ways to go before landing in the Black Hills. 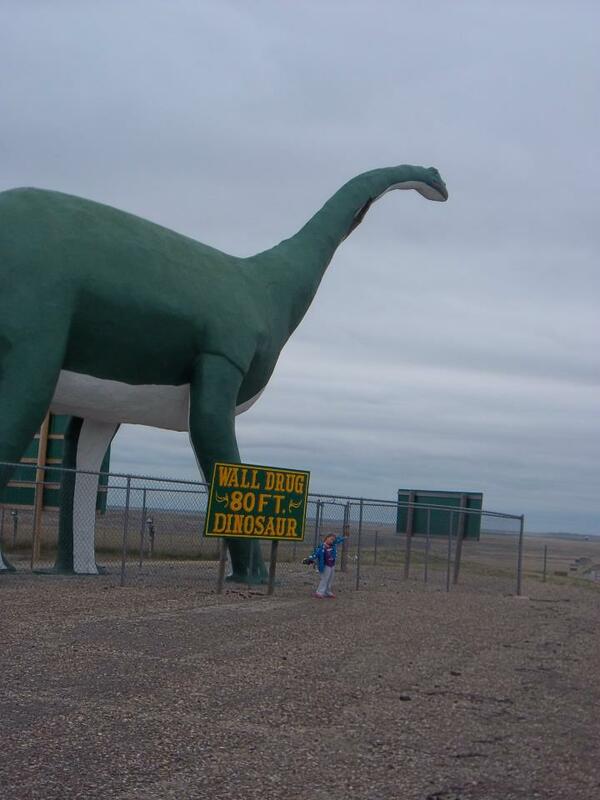 Soon enough, there was an 80 ft. dinosaur sticking his head over the very distant horizon. It didn’t take long before the exit in front of the giant green 80 ft. brachiosaurus came into view and the lil one’s eyes lit up again; we were getting good at getting this reaction. We had landed at Wall Drug, one of the many unplanned, unexpected stops that almost always go along with road trips. They had RV parking; it was cool enough to leave the dog in the fifth wheel and go enjoy lunch and just being a tourist for a few hours. I was looking forward to stretching the legs and filling our bellies, not to mention pump a little bit more knowledge into the lil one’s brain.